May 3rd, 2017, Vancouver, British Columbia: Evolving Gold Corp. (CSE: EVG) (FSE: EV7) (OTCB: EVOGF) (the "Company") (OTCB: EVOGF) (the “Company”) is pleased to announce it has acquired, by map staking, a package of 17 claims located next to Osisko’s Kan Property in the Labrador Trough, named the Oxen Property. The acquired claims show similar geology to the Kan Property, as well as multiple geochemical anomalies located glacially down-ice from the property, indicating a possible source located on the Oxen claims. Subsequently, additional claims were staked by Osisko; the Oxen Property is now entirely surrounded by Osisko Mining claims. Osisko Mining optioned its Kan Property to Barrick Gold, under which agreement Barrick Gold will have to spend $15 million CAD on the Kan Property over 4 years to earn a 70% interest. Following the disclosure of this agreement, EVG was able to acquire 17 claims located approximately 12km east of the main Kan showing. 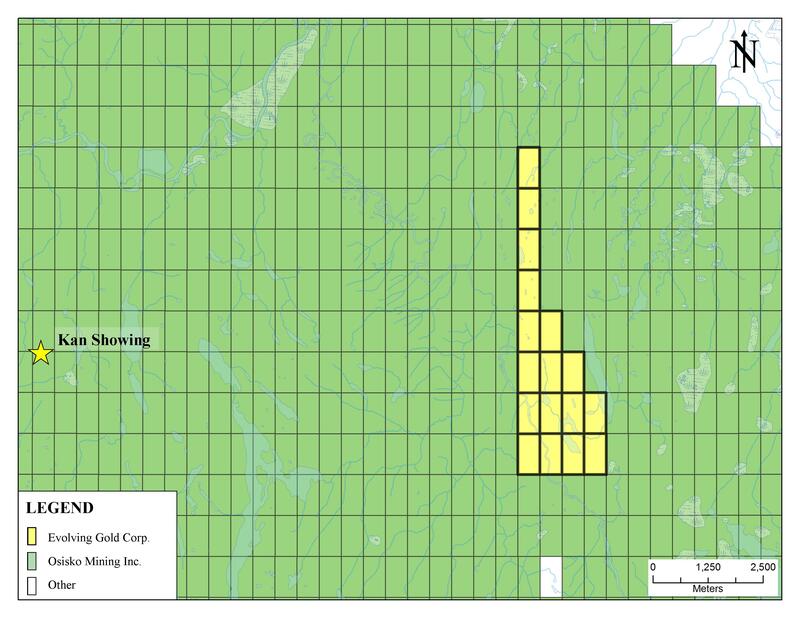 EVG is confident that the amount of money to be spent by Barrick exploring the Kan area will generate significant interest in this region of the Labrador Trough, which may increase the value of the Oxen land package. The Oxen claim group can be seen on this map: http://evolvinggold.com/i/img/oxen-map.jpg. The 17 Oxen claims cover 788.59 ha (7.88 km2), and include the Lower, Middle and Upper units of the Baby Formation along with the Montagnais Sills and the Hellancourt basalt formation. Targets of interest on the Oxen Property include Zn-Cu- Pb massive sulphide mineralization hosted in carbonatized basalt and black shales of the Baby Formation, as found at Osisko’s Kan showing. Gold mineralization was also found in sediment-hosted polymetallic vein mineralization in the Baby Formation nearby. The Oxen claims also cover the Montagnais Sills unit which has demonstrated gold showings in proximity to the Baby Formation. Two thrust faults cross the Oxen property in a NNW to SSE direction, which have the potential for serving as control structures for mineral deposition. Field exploration work will target banded iron formations which may be proximal to the thrust faults. Significant gold discoveries have been made at e.g. Meadowbank and Meliadine where these geological features are present. Quebec government lake and river sediment surveys conducted in 2009 and 2010 defined multiple geochemical anomalies in cobalt, copper, zinc and nickel glacially down-ice from the Oxen Property. The glacial drift direction indicates that the source of those anomalous samples could be located on the Oxen Property. Table 1 includes the different metallic anomalies reported down ice from the Property. The location of the metallic anomalies along with the regional claims and simplified geological features can be seen on this map: http://evolvinggold.com/i/img/oxen-map-features.jpg. The multiple zinc anomalies and associated copper are good indicators for Volcanic Massive Sulphides (“VMS”). Evolving Gold intends to explore the property by prospecting and till sampling up ice from the numerous anomalies. Steven Lauzier, P. Geo OGQ, a Qualified Person (“QP”) as defined by National Instrument 43-101 guidelines, has reviewed and approved the technical content provided in this news release. 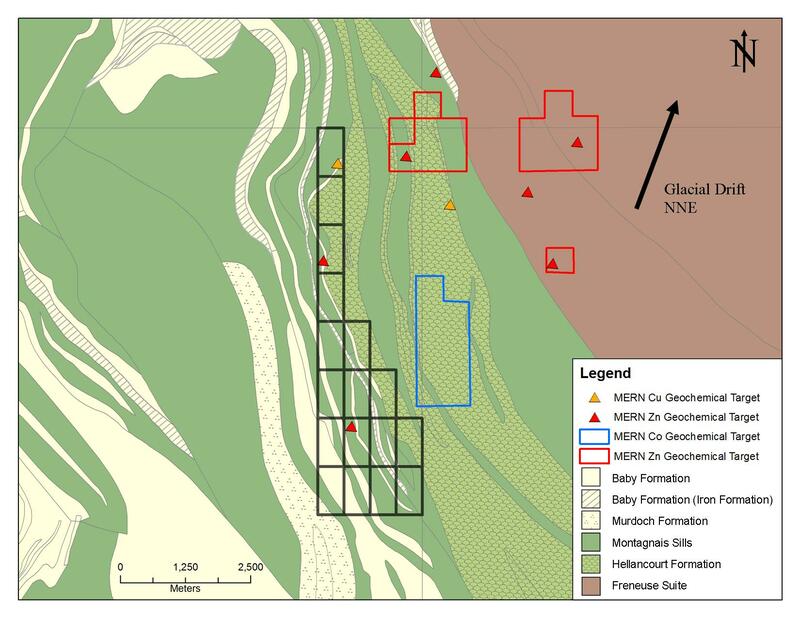 Evolving Gold is focused on exploring the 72.5 square kilometre (total area) Lithium Lakes property in Quebec, located about 10 km north of the Route du Nord and between eight and 30 km from Nemaska Lithium's Whabouchi Project. Neither Canada Stock Exchange nor its Regulation Services Provider (as that term is defined in the policies of the Canada Stock Exchange) accepts responsibility for the adequacy or accuracy of this release.